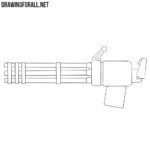 On our site there is a category called “Weapons” where we post the most different types of weapons, from daggers to bazookas. And today this section will be updated with a lesson about how to draw a rifle for beginners. We decided to do this lesson on the example of the M16 semi-automatic rifle. In order to draw a smooth and symmetrical rifle, first we need to sketch out the main outlines with the help of simple geometric shapes. Try to repeat all the forms, as you can see, it is quite simple. We continue to use simple lines and equally simple geometric shapes. Here we need to outline some of the main parts of the rifle, such as a sight, a handle and a trigger. 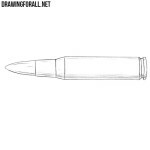 Starting from this step, we will use clear and dark lines to draw out the details of the rifle. Carefully draw the barrel, high sight and handguard. In the same step, we delete unnecessary guidelines in the area that was drawn. 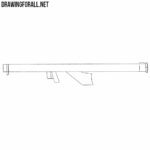 Continuing the lines from the previous step, we will draw out the details of the middle part of the rifle. In this step, we need to draw out the body of the rifle, the handle, and the trigger. 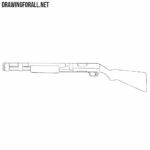 And the last step of the lesson about how to draw a rifle for beginner, in which we will draw out the magazine, the handle and the stock. And at the very end of the tutorial we delete all the remaining auxiliary lines from our weapon. 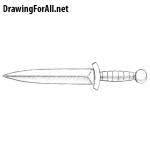 Do you think this drawing lesson was easy enough? 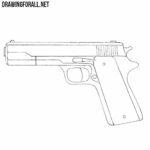 Write to us about this, and about what difficulties you encountered in the process of drawing a rifle in the comments to this article. I’ve already perfected it and it looks awesome with the rainbow colours. What step caused you the greatest difficulties?